Our Purpose: Help people achieve financial peace of mind through high-quality, custom tailored solutions that assist them in effectively planning to meet their financial needs and goals Our Mission: Deliver high quality returns -- generation to generation Establishing the right financial advisory relationship is one of the most important decisions you will make. 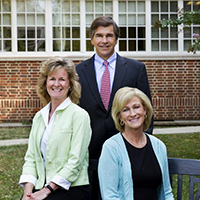 The Stewart Wealth Management Group at Janney Montgomery Scott LLC has been providing comprehensive portfolio advice to corporate pension plans, endowments, foundations and individuals for over 25 years. We are committed to simplifying the investment process and making the management of wealth manageable for our clients. Whether you are an individual, a business or a philanthropic organization, your financial needs and goals are unique. Our team, with over 60 years of combined experience, recognizes the need to custom tailor the solutions and services we offer to meet the unique needs and goals of each individual client. The Stewart Wealth Management Group utilizes a consultative approach to portfolio management, working with our clients to help them attain financial peace of mind.